hey dudes! today’s vegan field report comes to us from reader george nickle who recently hit up the all vegan plant restaurant in asheville north carolina. i come from LA, a land with many vegan options, and i am freaking out over this place. it looks amazing. we need more fine vegan restaurants in this town. Asheville, NC has been one of my favorite places since the 90s. So when Plant was mentioned in the field report about VegFest 2011 on Quarry Girl back in August, I knew I had to go next time I was in NC. I finally had dinner at Plant last week. Plant is Asheville’s first all Vegan restaurant, and two bites in I decided that it is one of the best Vegan restaurants in the country. I was immediately reminded of my fine dining experiences at Millennium in San Francisco and Candle 79 in NYC. After being open just a few months it compares favorably to both! The restaurant is conveniently located in downtown Asheville and has a simple, elegant modern interior that doesn’t detract from the real star of the show: the food. The food on other guests’ plates draw the eye as you are shown to your seat. By the time I sat I wanted to try everything I’d seen. It was less than an hour before closing so my partner and I ordered from the dinner menu. He ordered the Nightly Soup, which was a creamy potato, and I had the Flame & Herb Seitan Skewers. The presentation was beautiful. 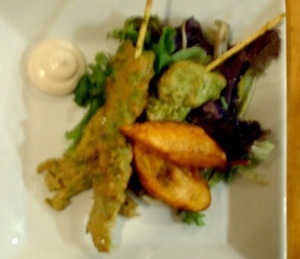 The Skewers came with two pieces of plantain, which I didn’t expect to go with them but did. They were caramelized and crunchy on the outside, breaking apart to reveal a warm gooey center. The Skewers themselves were large knots of perfect seitan spiced with herbs that were just tangy enough without being overpowering. 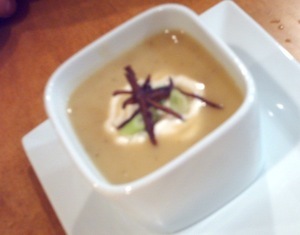 They came on a bed of wonderfully fresh greens and a dollop of “sour cream” that complemented the flavor of the herbs. The main thing you find with your first bites (or sips of that amazingly creamy soup) of food at Plant is flavor! Everything tastes as if there is more to it than meets the eye. 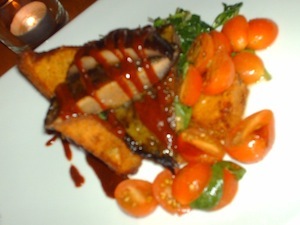 For my entree I had the Smoked Portobello Steak. Again, the presentation was lovely, a mix of colors and textures arranged on stark white plates. Halves of grape tomatoes glistening in light dressing and mingling with fresh basil were off to the side. It tasted as good as it looked. Again, lightly tangy with enough flavor to make you hungry but not overpower the senses. Tender sauteed spinach mixed with bits of garlic hid under the thick Portobello Steaks, drizzled with “v1” sauce that tasted just like the A1 you remember. And those steaks were thick, juicy and filled with a rich balsamic vinegar flavor that only enhanced the smoky mushrooms. Complementing them were triangles of crispy polenta. Divine!